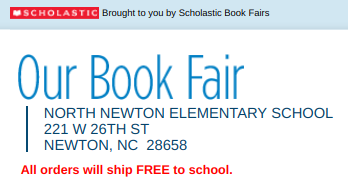 Online Book Fair Open Through March 5th!!! North Newton has a new Facebook page! Please "like" the North Newton new Facebook page to see all the wonderful things happening at North Newton and to keep up on the latest information! PARENTS, IF YOU HAVE NOT COMPLETED YOUR UPDATED INFOSNAP FOR YOUR RETURNING STUDENT, OR CREATED A NEW ACCOUNT FOR A TRANSFER STUDENT, PLEASE CONTACT YOUR CHILD'S TEACHER FOR THEIR UNIQUE INFOSNAP CODE.